Back in January, I mentioned that sometimes the music industry caught up with me, and I'm pleased to say that it has happened again! As a result of asking about gen~ in Live 10 for a blog article, I exchanged emails with Darwin Grosse, who is the Director of Education and Customer Services at Cycling '74, and he asked me if I would be interested in being interviewed for the 'Art + Music + Technology' podcast page. Darwin Grosse's web-page contains a lot of useful and interesting links. Here's a surprise entry from the 'rapid gestation' pipeline - a hex frequency shifter that is totally intended to mangle spectra! This is not a scientific instrument designed to move technology towards ever higher fidelity. It joins the 'Ironic Distortion' device and a few of my other devices on the 'noise' side of the audio processing 'sine to noise' axis. So that's the advert - but what is happening inside? (I would say 'behind the front panel', but I can't see this ever making it into real hardware!) Well, this is a 'true' stereo device, and so there are two parallel audio paths, each with 3 frequency shifters, and so it definitely qualifies for the name: 'Hex'. But rather than follow the path forged by the many other frequency shifters that have already been created in M4L, I threw caution to the winds and went free-form, so the routing between the frequency shifters is not preset. The outputs from the upper and lower sidebands of the frequency shifters, plus the inputs to the next shifter, and the input to the auto panned outputs, all go into two routing matrices where you can connect them together as you like. The default is 'no connections', so all of those [X] toggles are dark, and there is no audio output (unless you turn the rotary control to 'Dry', of course!). Probably a good starting point is to click on the [X] toggles for the '+' in the Left and Right routing matrices. 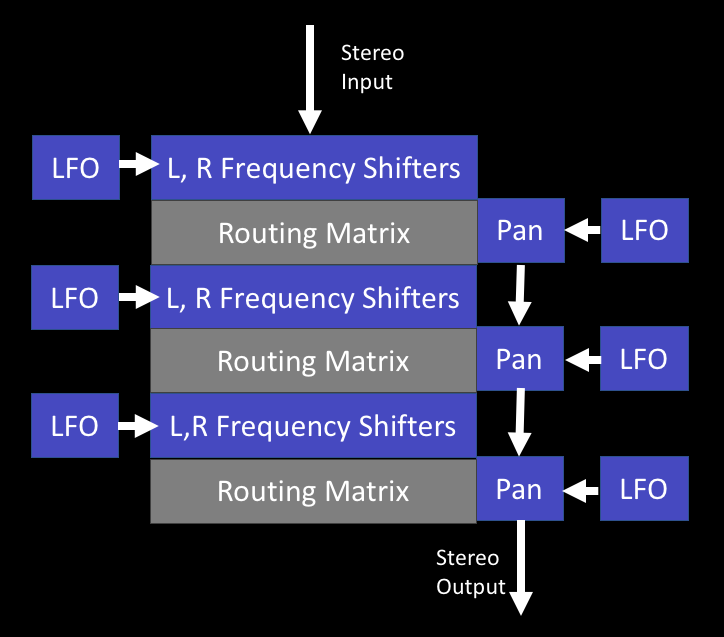 This will route the upper sideband output of the first frequency shifter into the input of the second, and so on, through all three shifters. You won't hear anything at the output until you also route the auto-pans, which are the extra [X] toggles in the centre section between the two channels. So select the lowest of those [X] toggles to hear the full 'hex shifter' sound! This is probably a good time to set all of those pan rate controls to different values so that the stereo output will be fully spatialised! 'Rate' mode is slightly more unusual, and I haven't seen anything quite like it in any of the effects units that I've played with... What it does is sample-and-hold the incoming audio, and use this to shift the frequency - and it sounds really interesting and different... The 'Mod ' button has the same effect: 'off' hides the controls and mutes the LFO, whilst 'on' shows the controls and allows the frequency shift value to be modulated by the LFO. You can use HexFrequencyShifter as a 'drone' processor, where it can turn rather ordinary bland sounds into something altogether more complicated. Frequency shifting tends to be rather destructive to sounds that have to be in tune with other sounds, and so, at first sight, this is not a device to be used for processing an instrument that will then be played alongside other tuned instruments. 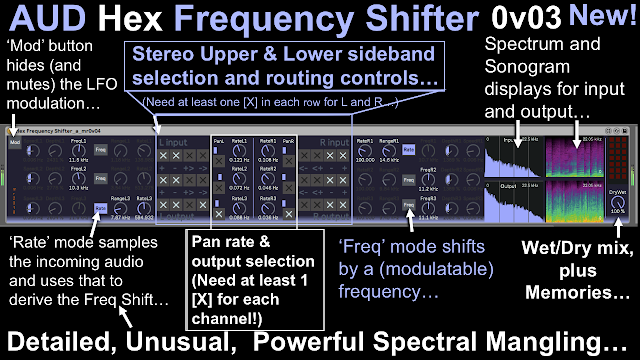 You can download HexFrequencyShifter for free from MaxForLive.com. In terms of modular equivalents, then the 'Bode Frequency Shifter' was one of the modules that appeared on classic Moog modulars, although I'm not sure that they appear in many lists of 'basic' modules for a minimal modular synthesis setup! But since I added a 'Scale' device recently, then I'm going to add a 'Frequency Shifter' module as well. Based on this, then my estimate is that you are going to need 6 frequency shifters, plus 6 LFOs, plus three stereo auto-pans, which gives a grand total of about 18 ME. Some time ago, I looked at the 'factory' Ableton Live MaxForLive device called 'Scale', and in particular the 'Inverted and Useless' preset, which is both a good and a bad description. Behind the scenes, I was working on my own 'scale' device, and this has recently been updated to the point at which it is probably releasable. Yes, I know that I often seem to release things too early, but sometimes things that I don't release go through slow and tortuous development behind the scenes (Waverne 2 is one example), and there are also devices where the beta testing takes longer than expected. Anyway, NoteScalery is now at the point where I think it is ready for people to play with, and it will be followed by a number of other related devices that depend on having some way of controlling the mode/scale of the notes that they produce. All of the data spreadsheets that I produced in order to create NoteScalery will be made freely available for download. Now because of the way that notes have an interesting property related to multiples of pitch, then, if you go up in semitones from a given note, after 12 semitones, you end up at the same note, but one octave higher, and this note has double the pitch or frequency of the note where you started. Octaves are very special intervals because of this doubling (or halving if you go down in pitch), and when you combine this with the equal intervals between the semitones (in equal temperament), then this hugely influences the way that people think about the way that notes work together. 12 notes in a familiar black and white pattern, and it repeats every octave, so everything must repeat every octave, yes? You can also see a problem when you have minor scales that are different when they are ascending or descending, and when you start to invert the notes in a scale then things can go very weird. So the idea that a scale applies to an octave of notes is a nice tidy approximation that works in a lot of cases, but it isn't perfect for all cases. So how are MIDI Scale devices typically implemented? Well, they use octaves - they show which notes are in the scale for an octave, and just apply this across the whole the note range. Simple. On the left is the raw Max code. In the middle I have marked up the main sections, and on the right is the block diagram of what is happening. So after the decoding of the incoming MIDI messages, then there is the split into two sets of numbers: Note numbers, and Octave numbers. Note numbers go from 0-11 and indicate which note in the octave has been received. To extract this from the raw MIDI Note Number you just do a modulo 12, which is what the '%12' object does - it just repeatedly subtracts 12 until the result is less than twelve. You probably know this as a 'remainder' - the number that is left when you do a division. 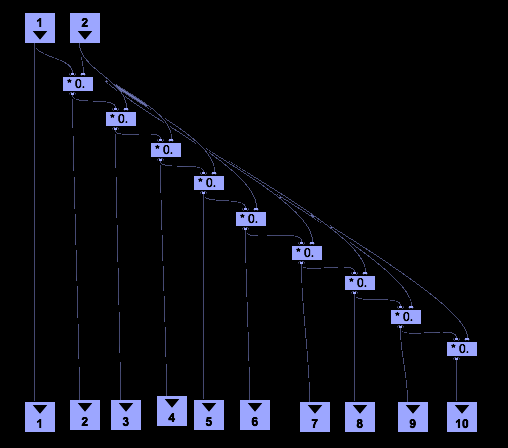 The Octave number is interesting, because when you 'repeatedly subtract' in the modulo function to get the remainder, then the number of times that you repeat is the Octave number. So if the MIDI Note number that was received was 25 then subtracting 12 gives 13, and subtracting 12 from that gives 1, so we know that the Note number is 1 (if C=0, then 1 will be C#), and the Octave number is 2, because we had to subtract 12 twice to get a remainder which was less than 12. So the MIDI Note was a C# in the third octave. 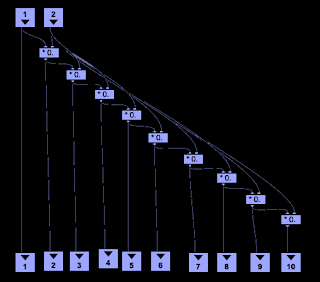 Now that there is only one octave's worth of Note numbers, then mapping which input numbers produce which output numbers requires just a 12x12 table. 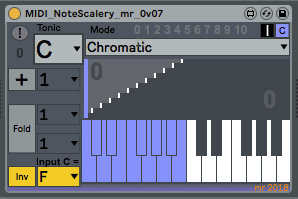 Nothing needs to happen to the Octave numbers - they just pass through to the output. The output stage is shown as an addition with a '+' symbol, but actually there's two extra refinements in the code. First notice that the output of the map table has another modulo function, so if there is any unexpected value in the table, then the only Note numbers we can get out will be less than 12. Second, the Octave number is multiplied by 12, so that we undo all of the repeated subtractions. 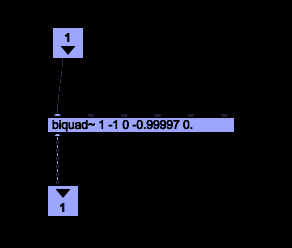 When we add together the mapped Note number and the multiplied Octave number, then we get the MIDI Note number for the mapped note on the scale - as defined in the map table. So that's how Ableton's own example does it, and you might be forgiven for thinking that we are at the end. We have a working Scale device! Unfortunately, this 'Split' approach is not perfect. 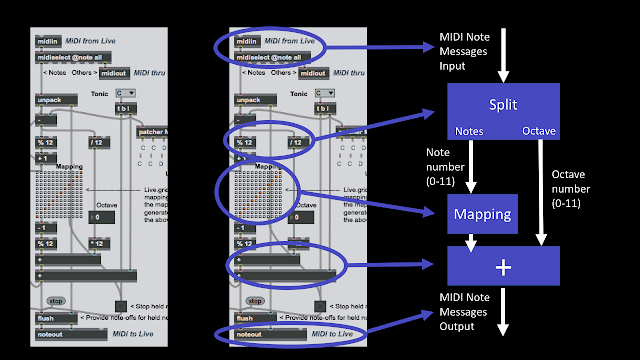 As I have mentioned before, the behaviour of this type of scale mapping device breaks down if you want to invert MIDI notes, so that the high notes play low notes, and vice-versa. It is well worth going back and seeing how things can go very weird... But the main problem is those two 'modulo' functions that are cairned out on the MIDI Note numbers. You remember that these are just repeatedly subtracting 12 until they get a remainder of less than 12? Well, this requires a loop that repeatedly subtracts 12, and inside that loop is a check to see if the remainder is less than 12. For a typical MIDI Note number of say 60, then this is going to require quite a lot of operations to be carried out, and it turns out that whilst a '+' operation can be very quick, the 'modulo' function can be a lot slower. If we think what is happening here, then we have two slow operations being carried out on each and every MIDI Note message, and this is going to delay the start of the note being played by the instrument (synth, sampler...) in that channel inside the Live DAW. Unwanted delay is not good. To remove the delay, then one method is to remove the modulo functions. This can be achieved by using a larger table - and to cover all of the MIDI Note range then we would need a table of 128x128. Here's a conceptual diagram that shows the 12x12 tables from the Scale device, mosaic'ed together to produce a 128x128 table, so that we can map any incoming MIDI Note number to any outgoing MIDI Note number, and the only operation that is required is to look up the MIDI Note number and see what the output should be - easy to do, and fast! 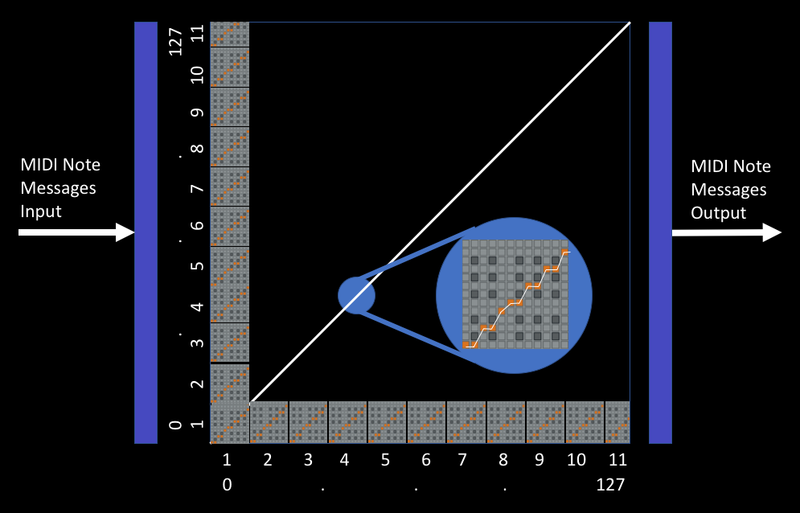 Actually, most of the time, the inputs and outputs are going to be quite similar, and so if we look at a 'Chromatic' scale, where each input note maps to the same output note, then actually, most of those 'Scale' tables will not have any orange squares in them at all - the only orange squares are gong to be on the lower left to upper right diagonal. 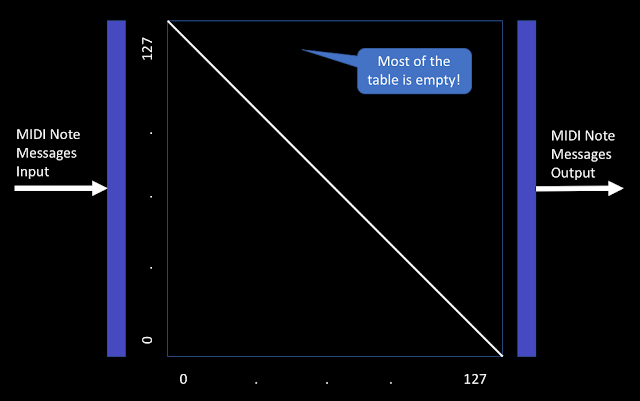 So the 'copy and paste'd Scale tables in the diagram are not a fair reflection of reality. For an 'Inverse and Useful' mapping, then the diagonal just goes the other way. 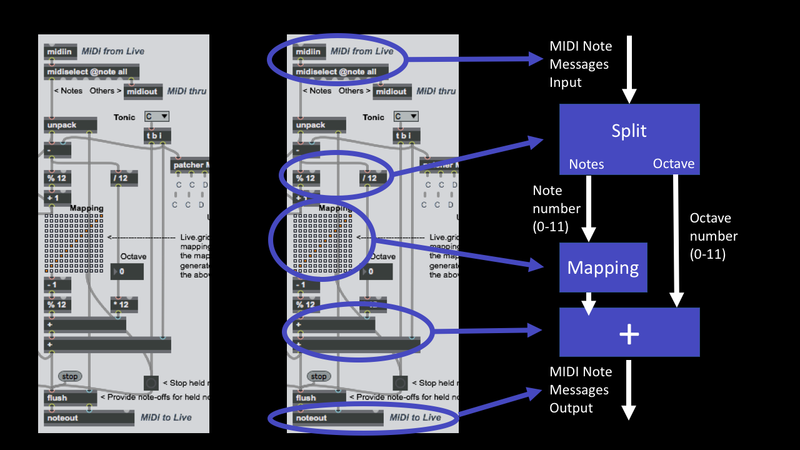 Unlike the 'Scale' device, this mapping works perfectly - it produces low MIDI note outputs for high MIDI input notes, and vice-verse, and with low delay time. In this screenshot the 'Scale' tables are not shown, and you can see that most of the table is empty. In this case, there will be just 128 orange squares along that diagonal: one for each input note (mapping it to the inverted output). 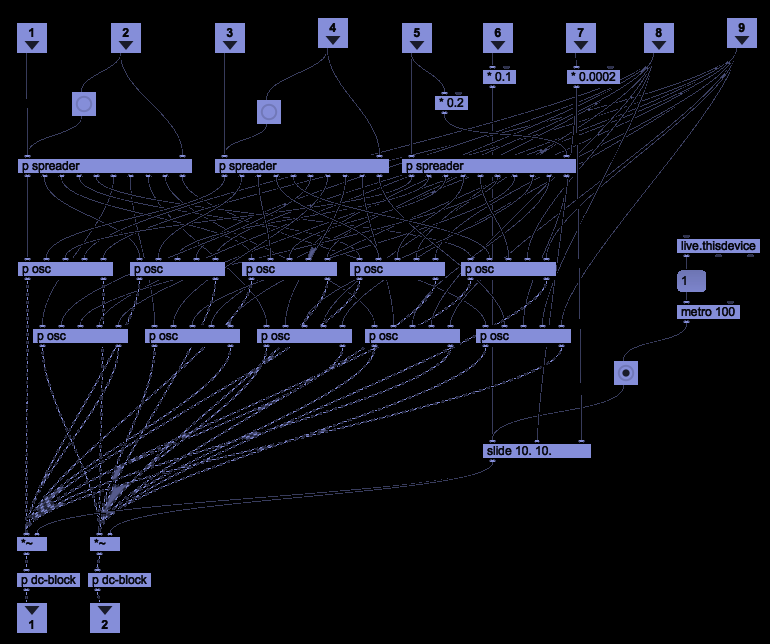 And that's what is inside my MIDINoteScalery device - a 128x128 table (mostly empty), plus a few utilities and an interesting way of visualising the scale and the way it maps the input notes to the output notes. 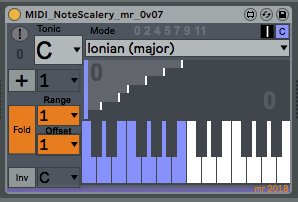 Ableton's Scale device has the incoming MIDI notes going vertically, and the outputs horizontally. This isn't how MaxForLive normally shows keyboards, and so the table needs to be rotated along the diagonal - the input notes now match to the horizontal axis of the table. 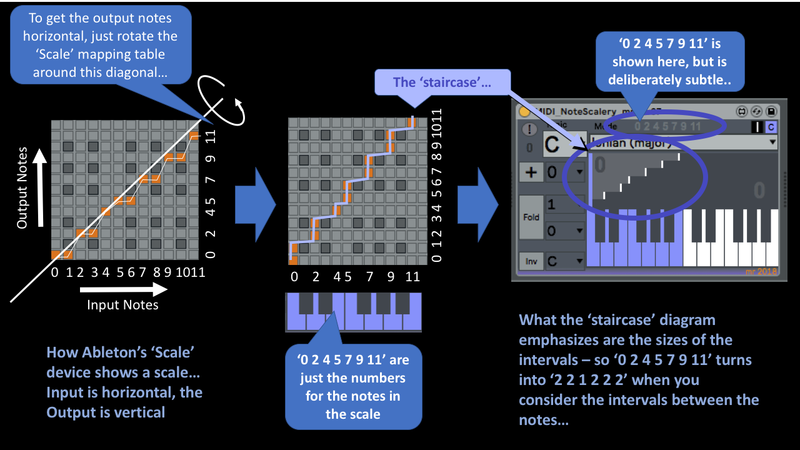 The orange squares have been replaced with a 'staircase' diagram that makes it easy to see if the interval between output notes is one semitone, two semitones, three, etc. For the 'C Major' scale shown here, the C# isn't present in the output, and so the interval between the C and the D is 2 semitones, so the 'tread' of the staircase is 2 semitones wide. The next interval is from D to E, which is 2 semitones again, and so the tread is 2 semitones wide. The next interval is from the E to the F, which is only 1 semitone, so the tread is only 1 semitone wide, and you can see this in the 'staircase' diagram. 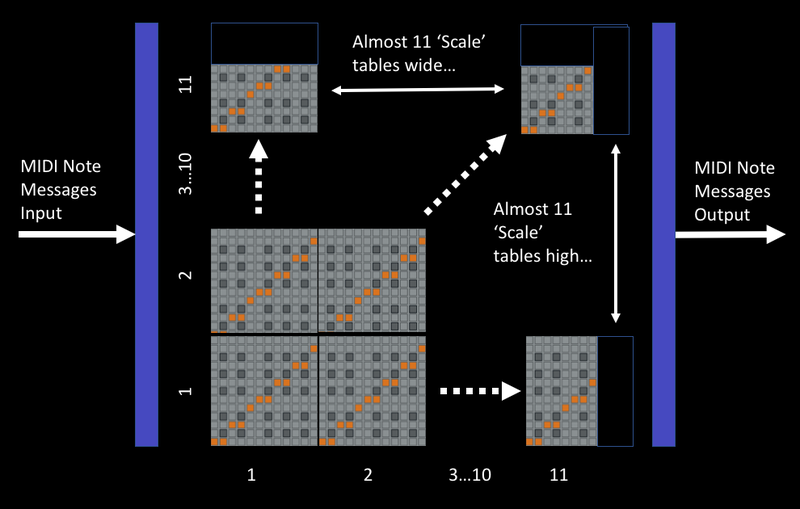 So how do you make a mapping table? In this post I'm going to show you how to create the table, and all of the spreadsheets that I show will be available to download for free, so you can make your own custom tables, and your own scale/mode mapping devices if you want to. There are lots of scales, and so I chose two sets: scales starting with capital letters are basic scales, whilst scales starting with lower case letters are more unusual. The scales are deliberately organised in this order, with 'invert' as the final scale. The basic scales (or more correctly, modes) are shown above with a base key (or Tonic) of C. The 'Chromatic' mode is a 1:1 mapping - the output is the same as the input! 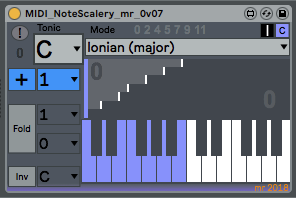 The Ionian mode shown here only outputs the white notes; C, D, E, F, G, A, and B. To be able to create the mapping table, then the notes need to be in a form where MaxForLive can work with them. 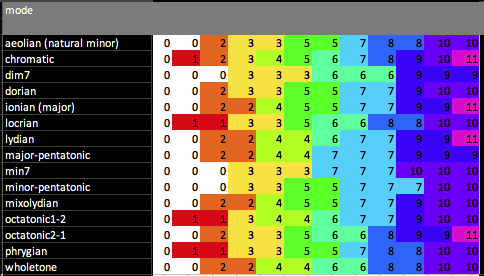 Here is the same table, converted to numbers instead of note names. When I did the conversion, I didn't subtract 1 from the numbers, and so you need to do this to get them into the form that is used to represent the notes in the octave: so C is 0, C# is 1, D is 2, etc. In this table, then the numbers from the previous table have been converted again - this time into a form where the output note number is shown, and so there are always 12 outputs for the 12 note inputs in an octave. So, reading across the 'Chromatic' mode, the outputs are '0 1 2 3 4 5 6 7 8 9 10 and 11'. Reading across the 'Ionian (C Major) mode, the outputs are '0 0 2 2 4 5 5 7 7 9 9 and 11' - which means that and C# inputs will only produce a C output (the '0'), D and D# will only produce a D output (the '2'), and so on. Note that some of the modes only have a small number of output notes - the minor 7th has only 0, 3, 7 and 10, for instance. Now this table is almost useful! 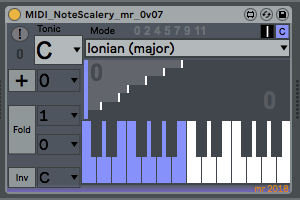 If you use the 'Ionian C Major' mode, then the numbers indicate what the output should be for each input. So the numbers are '0 0 2 2 4 5 5 7 7 9 9 and 11', and this means that if the input is a C or C# (note numbers 0 and 1), then the output will be 0 (C). For the next two note inputs, D and D# (2 and 3) then the output is 2 (D), and so on. These numbers are a simple lookup table where you move horizontally for the input note number, and the number in the mapping table is the output note number. To read this type of table into a MaxForLive 'coll' object, so that the numbers can be fed into a mapping 'zl lookup' object, then additional formatting is required. This is just a case of concatenating columns in the spreadsheet, as shown above. 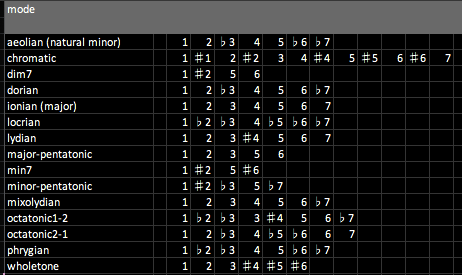 This table has entries from outputs of 0-127 for each of the 128 MIDI Note input numbers. 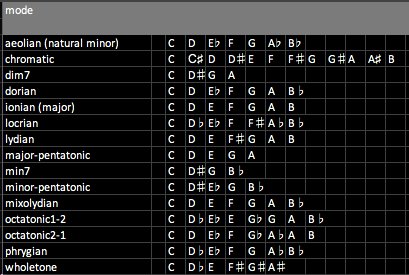 The full table is in the downloadable spreadsheet, and contains complete tables for all of the basic and unusual modes. Note that there isn't any magic or deep maths in the mapping table - it literally is just horizontal rows of numbers that specify what the output number is for a given input number. 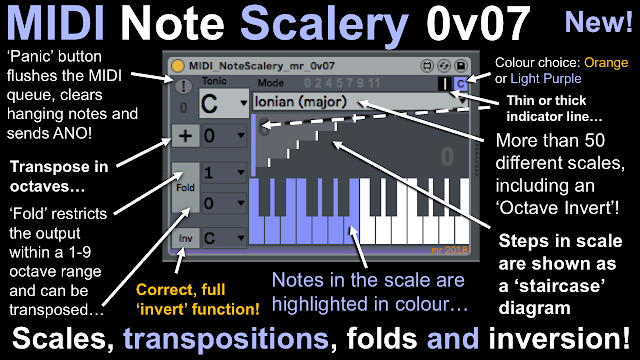 The default setting for the MIDI NoteScalery device is a straight-forward mapping of input notes to output notes. The output notes are shown as colour (blue or orange - selectable), and when an accidental (black) note is output then that is shown in colour. The '+' button (blue) allows the output notes to be transposed. If the transposition goes outside of the MIDI note range then the notes will be folded back into range. The 'Inv' button (yellow) allows the keyboard to be inverted - perfectly. 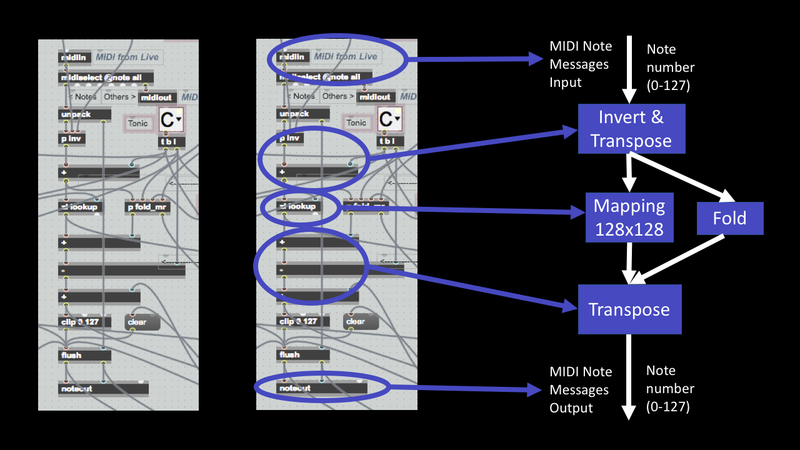 High input MIDI notes will produce low MIDI note outputs, and vice-versa. This can be done for any of the modes, and it is recommended that the 'Chromatic' mode is used initially. inversion can be set to happen around any note - in the examples shown, a C input will be output as an F.
MIDI NoteScalery is one of a family of utilities intended for exploring scales and modes. All of the devices will be available from MaxForLive.com for free (and in fact, some of them are already available!). 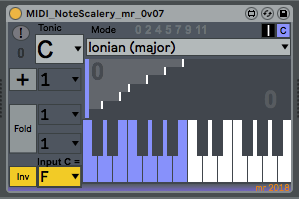 The two devices that are included by Ableton in Live are 'Scale' and 'PitchScaler'. 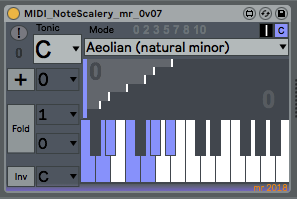 You can download MIDNoteScalery for free from MaxForLive.com. 'Basic' - the first tab contains just the basic scales in a 'coll'-friendly format. Just a 'cover'-screen, really. 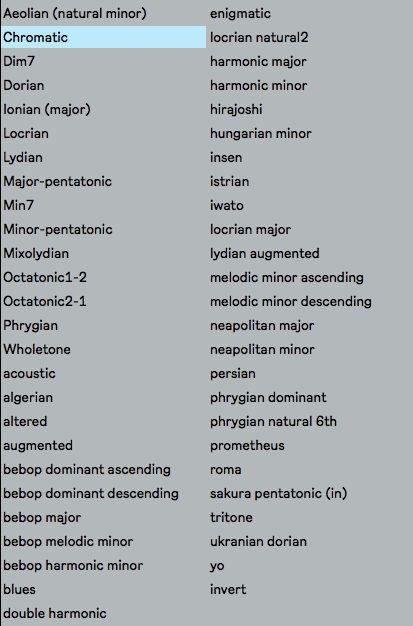 'One Octave' - the second tab has all of the data for a single octave for the basic and extended/extra scales, and contains just about all of the notes and numbers that should be useful for making your own scales and mapping tables. The data goes quite a long way across the the right... You can use this tab for developing and testing your own scales (and getting used to the 'CONCATENATE' function that is used all over this spreadsheet, and which is indispensable for assembling data into arcane formats...) and reformatting to suit your own development environment. If you are interested in how to use the Excel 'CONCATENATE' function, then you may find this spreadsheet useful - it is used everywhere to assemble numbers into the format that objects like 'coll' expect. If/when I get around to recoding the 'fold' code so that it doesn't use the modulo function, then the table development spreadsheets will be made available for free as well. In terms of modular equivalents, then it depends if you count a 'Scale' module as a 'basic' module, and once again you rapidly get to the point where you want to step outside of the 'basic modules only' rule and go into more specialist modules. I'm going to add a 'Scale' module to the 'basic' set, and so my estimate is that full functionality is going to require a scale module plus some additional CV processing (for invert and fold) and so this gives a grand total of 3 ME. In the first part of this post, I covered the 'gen' part of how I made an FM drone generator based on the Rebel Technology Tutorial Workshop at Somerset House, London, in December. 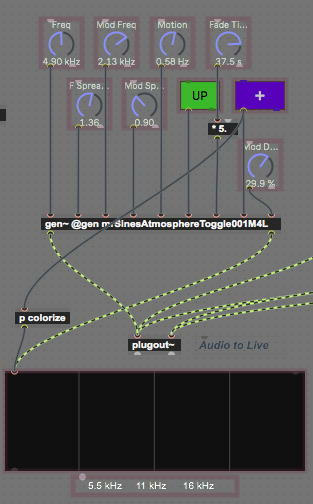 In this second part, I look at taking the gen code and turning it into a Max For Live device. So here's the gen~ module inside a Max For Live wrapper, with added spectrum display and rotary controls. Now you may have seen a social media post reporting that some versions of Live 10 and Max 8 doesn’t do exactly what you might expect with gen~. 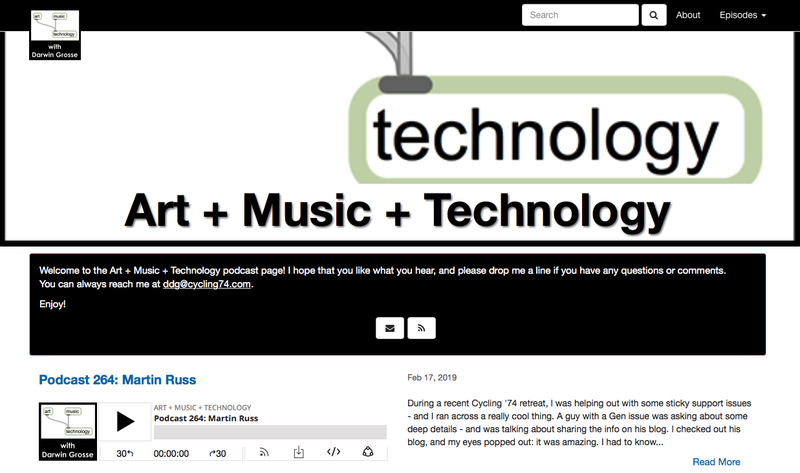 I saw it, so I contacted Cycling’ 74 and Ableton (which, btw, is always the best route: social media can sometimes be unreliable) and found that the Live 10.0.6 release should be fine with editing gen~ if you are using the full licensed Max 7 or Max 8. As a related sideline, I also learned something very interesting: Max 8 introduces a new object called ‘gen’ that works for events. Despite the name, that lack of a squiggly tilda is very significant. The underlying technology that you see in all of the gen~ patchers that I have been showing is called Gen, and it provides access to ‘lower level’ objects than the ones you get in Max, as well as embedded code. In this example, I’m working with audio signals, and so I'm using the gen~ object, not the ‘gen’ object. So rather than try and explore unknown territory with Live 10.0.2 (and more recently 10.0.5) I decided to update from Max 7.3.5 to Max 8.0.2, and to convert from using gen~ to just Max so that I could leave exploring using gen~ inside Max For Live for later on, when Live 10.0.6 is released (which now seems to be part 3 of this two-part blog post). 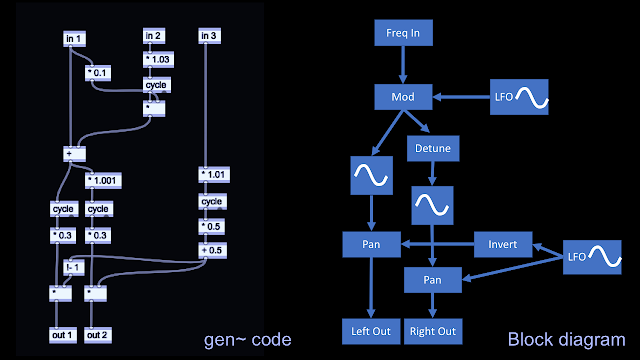 So not quite the easy 'write it in gen~ and use it anywhere' that I was going to do, but at least I had learnt a lot, and I was now slightly more cautious about my planned next step follow-up, which was to explore the possibilities of the 'gen~-to-VST’ process (part 4!). So the new 'first' task for a Max For Live version was now to turn this 'gen~' code into Max For Live for each of the bits that were inside the gen~ object in the grey screenshot several shots above. This is the top level of the gen~ code, directly translated from gen~ into Max. Because Max has a toggle button already, then all of the DIY code to create a toggle button isn't needed here! The number of oscillators has also been increased: 10 pairs giving 20 oscillators here. The 'spreader' code is almost exactly the same! Now I know that in Max 8, there are built-in functions to allow you to create 'spread' parameters for the multiple instances of a patch that you get by using the 'mc' object, but that would completely wipe out the 'gen~-to-Max' theme that I started with, and will be something I will look at in a future post! (Also, the spread functionality is in Max, and not in gen~, and so it won't work for projects that can only use gen~, as is the case with devices like those from Rebel technology. As in the gen~ code, in the translation-to-Max, there are two oscillators, one detuned by 1.001 (I didn't spend any time optimising this!) and a straight-forward LFO-driven anti-phase panning circuit. 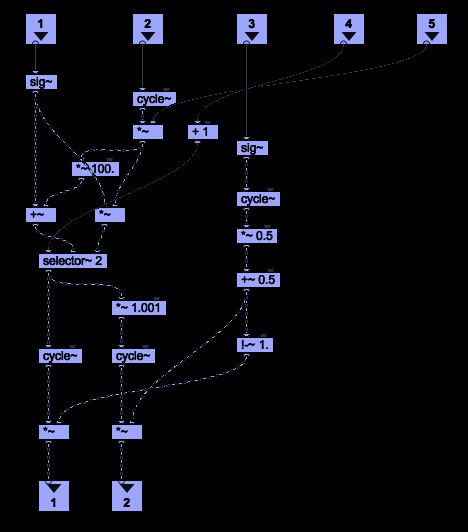 Above this, there is the modulation section, which has another LFO (that can also run at audio frequencies...) and uses a selectable '+' or '*'object to do the modulation. The '+' gives 'linear' 'vibrato-style' FM and the '*' 'multiply' object gives 'multiply' FM (FM = frequency modulation). In this implementation (with these frequencies and modulation indexes), then 'Linear/vibrato' gives a milder sound, whilst 'Multiply/FM' is much brighter in timbre. Having two different sound source timbres is always good, and in Max For Live it is easy to add a switch for it. In hardware devices like the OWL Pedal, then adding a toggle switch isn't quite as straight-forward - but I have done it and this is described in a previous post in this blog. One final translation is something which I've long wondered about why there isn't a pre-made object like this in Max. The 'dc-block' gen~ object stops DC voltages from getting into the audio output, and for an FM-based sound generator, then it should be very useful for avoiding 'clicky' speaker-stressing audio signals. 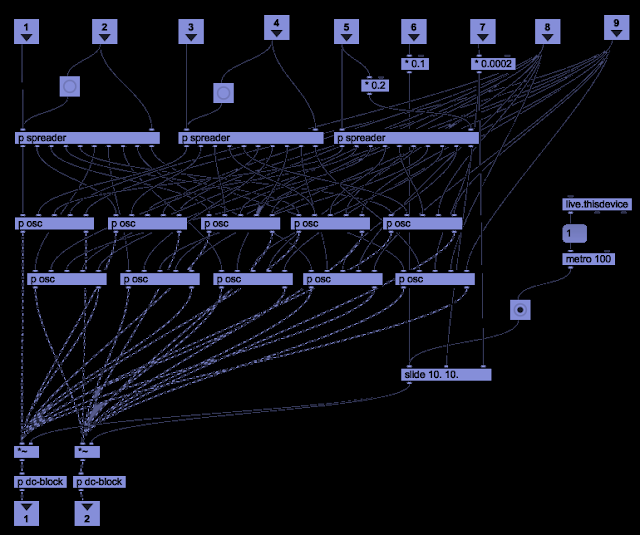 The contents of the DC-block patcher aren't complex - it is just that the parameters are tricky to remember! Anyway, the final MAX-ified version has three repetitions of the 20-oscillator 'grey screenshot' above, and so provides 60 oscillators across three separate 'parts'. This gives some very interesting sound generation possibilities. Finally, I added MIDI input for pitch, so this is now a simple monophonic instrument for making drone sounds with various timbres and frequency content. Enjoy! You can download INSTsineATMOSPHERE for free from MaxForLive.com. If you drag the .amxd file that you download from MaxForLive.com into the 'Third Party Packs' folder in 'Places' in the Brower panel on the left-hand side of Live, then you will be able to find it easily when you need it. In terms of modular equivalents, then reproducing this functionality using just basic modules in my modulars just required lots of VCOs and LFOs. But 60 VCOs is a lot of modules, and when you add LFOS it gives a modular equivalent of 120 ME, with a lot more modules required for the panning... If I throw away the 'you can only use basic modules' requirement, then things are different, but then we lose any basis of comparison.